In order to familiarize with the experience of local universities, clinics, as well as carrying out career guidance at the third decade of March 2019, the delegation of Osh State University, headed by the first vice-rector prof. A. O. Abduvaliev Head. kaf “Clinical Disciplines 2”, Ph.D., Associate Professor M.M. Bugubaeva and Ph.D., Associate Professor G. A. Subanova, also head. 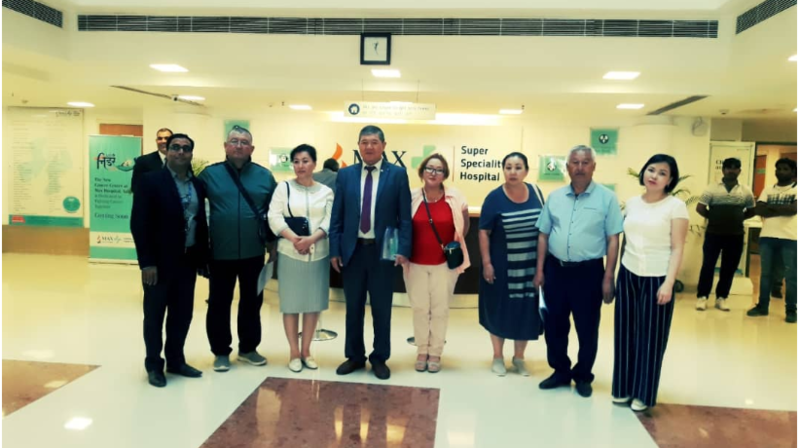 kaf “Social sciences and humanities” Ph.D., associate professor R. A. Ismailova, visited India. Two large oncology centers, such as MAX healthcare and JAYPEE in New Delhi, shared their experience and made it possible to get acquainted with the work of the clinics. In addition, the delegation met with leading experts of hospitals with Dr. Vijay Kumar, Dr. Manoj Sinha, Dr. Gaurav Mahajan, Dr. Sunil Dhar, Dr. Pravas Chandra Mishra, Dr. Vicas Gosvani, Dr. Sovjanya Aggarval, Dr. Gagan Saini, Dr. Shailendra Kumar Goel. It turned out that the oncologic transplant doctor Dr. Vijay Kumar, cardiologist Dr. Vijay Kumar Manoj Sinha also cooperate with the clinics of our country and periodically come to exchange experiences. As a result, contracts were drawn up with the heads of two large oncological centers. New delhi. In the future, MAX healthcare and JAYPEE clinics are ready to cooperate and share experience with Osh State University. Since the support of communication with graduates, their further interaction with the university, participation in their fate is an integral part of the work of any university, our delegation organized a meeting with graduates of the international medical faculty of Osh State University. During the conversation with our former students, it was noted that our university provides an excellent opportunity for self-realization and career growth for our graduates directly in their countries, particularly in India, and they certainly have something to share with the younger generation. Further, the staff of Osh State University met with the Ambassador of the Kyrgyz Republic in India with Asein Isayev at the Embassy of Kyrgyz Republic in New Delhi, India and presented the purpose of the visit to this country. Ambassador Asein Isaev warmly received a delegation from Osh State University and wished further success and prosperity to our university. Sights of India such as the Taj Mahal (Agra), Red Fort (Agra), India Gate (Mumbai), Elephanta Caves – architectural and karst complex (Mumbai) were not left without attention. Ultimately, the staff of the MMF as part of the delegation returned with great enthusiasm and a plan that they plan to implement in the course of the future work of the faculty. Introduction to the practice of soft skills in the department of "Clinical Disciplines 2"